Fresh crab. Fresh lime. Smooth avocado. Crunchy jicama and celery. A hint of cilantro, and a dab of mayo just to hold it all together. Those are the makings of a great amuse bouche we had before dinner tonight. 1 stalk celery, finely diced. Gently toss all ingredients together and chill. Serve on a bed of lettuce or in parmesan crisp cups. Finely grate about 2 cups of Parmesan Reggiano and about 1/2 cup of another cheese with a higher fat content (cheddar, Gruyère, etc). Mix together with your fingers and make 1-2 Tbsp. mounds on a parchment paper lined baking sheet. Bake at 400 degrees F for 4-5 minutes until golden and crisp. Working very quickly, slide the hot crisps into tiny muffin tins to form cups. Let cool in pan, then cool on a wire rack before filling with the crab mixture. Munch away and enjoy! 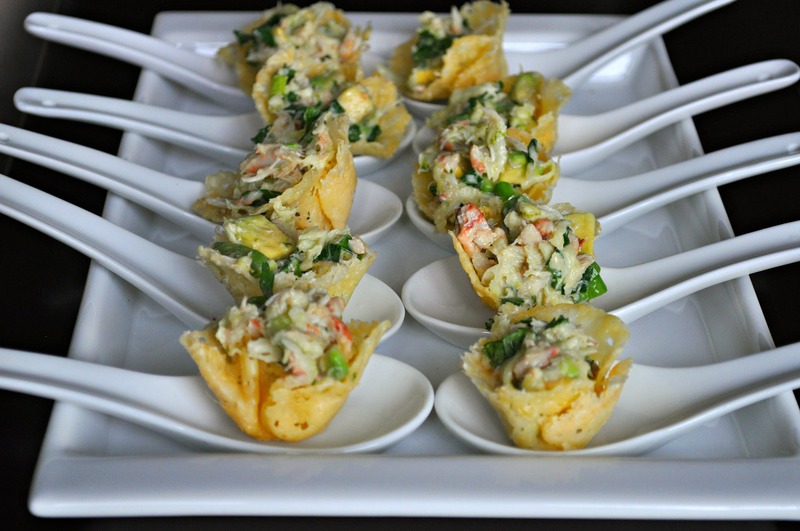 This entry was posted in amuse bouche, seafood and tagged amuse bouche, avocado amuse bouche, crab amuse bouche, crab salad, crab with avocado and lime, how to make parmesan cups, parmesan crisp cups, seafood amuse bouche. Bookmark the permalink.